Just got word that Alpha will no longer be making the Accuswing 2 and has no plans to make another swingweight calculator. By the same person, I was told that Dunlop/Srixon has one like the Accuswing 2 but I can't find it. Any ideas? Also, the Head 3 in 1...where do you get those? I've only seen pictures of the Head but it looks pretty slick. Haven't seen anyone in the US selling these but got a quote from Apollo in the UK out of curiosity....approx. $1,400usd. I could be wrong but I think the Alpha machine is made by Unique Detect Tech Co. in Taiwan. There are several machines on the Asian market that look like they may be made by Unique (Gosen, Prince and a couple brands I've never heard of). Do you have a contact for SoCal? Out of stock, no info on replacing. They used to have the accuswing 2 on Alibaba but they would not sell it to anyone in the US. Maybe now they will. Any update on this situation? 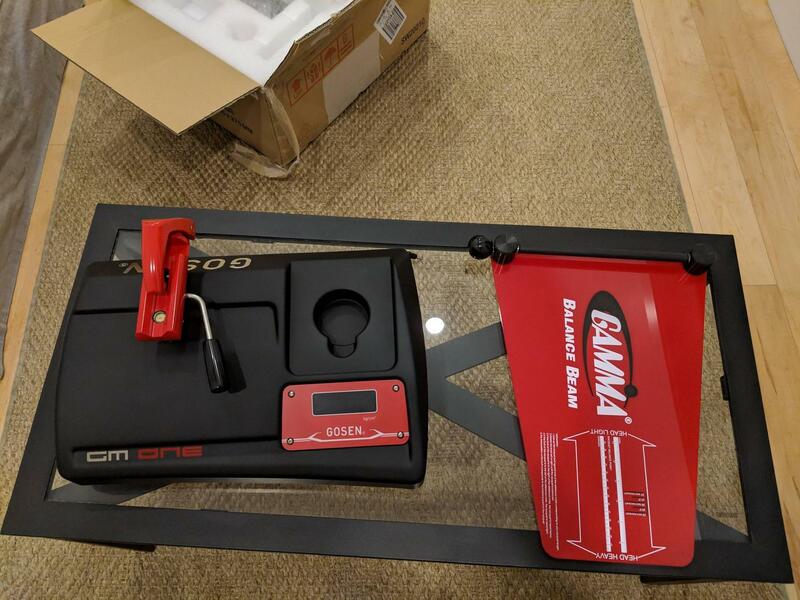 Looking to buy a swingweight machine. Not sure what the best option is currently. Accuswing can be found on Alibaba, whilst the Gosen machine is on Rakuten. It's insane that the most important machine for racquet customization is virtually impossible to find nowadays. I've exchanged emails with alibaba and they will not ship to USA. How much for the RDC? Interesting method Marco. Seems faster and more accurate then using the swingtool app or the tennis warehouse manual method. I will have to give it a shot on some racquets I have already measured on an RDC. Recently bought the Gosen Swingweight machine from R a k u t e n. Very happy with my purchase given the limited availability of these machines. Where are you located that you were actually able to get it shipped to you. I thought most of those sites wouldn't ship stateside? @cluckcluck I was looking at some pics from the ERSA symposium and theres a pic of a Dunlop machine that resembles the Gosen/Alpha. I'm trying to find the supplier for it. Please let me know what you find. Weird that basically all swingweight machines have vanished. Yep, I’ve seen it and it’s an awesome machine. But it’s also $3,600. A bit rich for my blood. Is it really that expensive? I thought it was mid 2s? Also, to my knowledge, not available in the U.S. yet anyway. I'm sorry, I thought the SW device is also available in the USA. I have my own RDC, but I'd also like to get the Head SW device to be on the safe side if the RDC breaks down. As far as I have heard, the price is said to be well under two thousand at least in Europe. From my understanding and talking to a few people many of the companies aren't sending machines to the U.S. yet because they don't have service available. I sort of understand but at the same time, as much as I can make off of an $800 machine, if it lasts two years I could just buy another one and not worry about the replacement cost. Customizing 4-6 sticks for 17-20 college players a year adds up to some $. I'd be willing to buy a new one without warranty or service if I could get it for the price of the accuswing no questions asked. I just want a simple swing weight machine!! why is it so hard/so expensive?!! Because some people are willing to pay for it. I can accurately measure SW, balance, weight, and TW with tools I made myself for <$20. There isn't a machine on the market (to my knowledge) that will accurately meausure TW. Of course my method takes a couple of minutes longer than the expensive ones. I feel you on this one. They are incredibly hard to find these days. I absolutely love the Prince PTC, but they cannot be found in the US anywhere. I see them all over Europe and S. America on Instagram. Plus, the TWU way of doing it manually makes it a much longer process than it should be; not to mention far less accurate. Is there a political justification, or is it just that. It would almost be worth it if you had the cash on hand to purchase 20. You would essentially become the only supplier for the machines stateside and could potentially charge a nice markup. Too bad I don't have 14k and a storage locker. Everyone wants a DW or a cheap LO they can tear down and scrape all the rust off. What do you think your chances are of finding 20 people to fork up the money for a new SW scale? Personally I would rather have a jewelry scale, SwingTool, and my homemade balance board. It is more accurate and I can measure TW. Everyones looking for cheap DO and LO machines, yet they preorder every new PJ of every 93 sq in and under frame looking for their "holy grail!" Maybe they just take two years off of buying frames, and get themselves a SW machine and start making some cash on a customization side hustle! EDIT: I wouldn’t call matching a hustle. For those with only one racket there is a strong argument either way customization is a waste of time and money. For those with 2 or more similar racket IMO is where customization helps to get the rackets matched. I think those with one racket could benefit for customization but likely won't because they're content with their racket. For those with two rackets, most club level players don't understand that just because the paint is the same, the rackets likely aren't. It's rare to see a club player with matched rackets even though I think many would benefit from it if for nothing else than to provide some consistency to their games. The only machine I know is the Babolat RDC but that's about 5k. Only other option is for people to send their sticks to get customized but that's costly too. Granted everyone may/could benitit from customization of their racket. It is very much like custom insoles in a shoe IMO. A person with completely wrong insoles or those with foot problems already may notice the different much more those someone with healthy feet or insoles that are near exactly what they need any way. And many people that have 2 or more rackets where they look the same have 1 that is their favorite. And if they have the ability to identify what they really need and both rackets can be match to those specs then great. But if you go out and buy a SW machine and match two rackets to the same specs and those specs are not the right specs for the player, then @StringGuruMRT was right when he said it is just a hustle. Not worth any more than a string, tension, or racket recommendation. If I went to the string forum and asked for a string that gave me the best in power and control I bet I get a lot of different recommendations, some helpful some not. Just because I have a SW machine does not mean I can set up a frame right. Correct and I absolutely agree. I think the important part is finding the spec that works best for the individual player first. That is why I believe even if they only have the one frame they could benefit from customization to it. I think everyone has a sort of goldilocks spec. Once you find it, you can take almost any racket, get it to that spec and it'll be playable. Purely my opinion but since I found mine I have matched 3 different sets of rackets and have been able to switch back and forth with ease aside from the different inherent power levels of the racket. They all swing similarly. Prostaff 97S, Head Extreme MP, and Head Radical MP all the same spec just slightly different feel and power level for each racket. I think my words got misinterpreted a bit! I simply made the side hustle comment as vernacular for additional source of income. I would love to see tennis take customization as seriously as golf! There are a lot of reasons to tweak your racquet to help it perform better for you, just remember that it isn't going to be the thing that fixes all that's wrong with your game. @SavvyStringer @StringGuruMRT @Irvin - as a differing perspective, the whole realm of matching frames, measuring DT, finding the most aerodynamic dampener, etc. can lead to people concentrating more on their gear than their game. I don't find a gram (or 5 - 10 for that matter) here or there make that much difference to my game. I play equally well with each frame and have adopted the mindset that there are too many rackets out there to spend a lot of time modding one to "fit". Manufacturers offer more choices in more weights, flexes, string patterns, and other configurations than ever before. They do a better job of figuring out what works than a jack leg like me. If/when I change frames again, it'll be to something really close to what I play with now. This conclusion was not rushed to. I look around at the really good players at our club. They, for the most part, play with the same frame for 10 - 15 years. One of the best players is still playing with a Wilson 6.1 16 X 18 K-Factor. He's been given 3 - 4 of them as well. I string for him and one of them is even a different grip size. He did take one out of the restring rotation recently; it broke. Now, even though it was broken and humming, he played with it (and extremely well) until the strings broke. Another player who played D1 at Baylor, plays with the same old Pro Kennex (the only player that does) and is not interested in frames. Finally, a young fellow who was around here, played with a Babolat Pure Drive. He played with overgrips that had the sticky on the starting end. He wound them backwards so he could "finish" them off with the sticky part. I asked him what tension/string he played with and he said he didn't know or care. He got a gig at John McEnroe's Tennis Academy a couple of years ago after teaching in the Caribbean for a couple of years. I say spend the money on lessons and practice, practice, practice. HA! I do the exact same thing! I start with the flat side and finish with the tapered side! I do it so that I don't (usually) have to trim the grip at the top! I'm pretty OCD about grips to be honest! I could not agree more. In golf who is to say a player needs a DC or a C6 swingtweight? I know if all the clubs in your set are not matched your consistency on distance goes out the window. But should a player be playing with a D2 or a D1 set of clubs? @StringGuruMRT - amen, brother! That's also the thing I love about Volkl, the grips are identical. I am going to demo a couple of Yonex frames, but honestly, I don't know why. The VS Tour 10 feels like an extension of my arm. I know exactly where the ball is going and trust the frame explicitly. I guess I hate prosperity! I finally have 99% of my gear figured out, racket, string, tension.....all that's left is PRACTICE -- and I'm 60! I managed to find a PTC. After receiving it I took my two rackets that I 'matched' by hand with just balance and overall weight. They were only off by 3 points of swing weight. I could feel it but I wasn't sure how to adjust it without the sw measurement. I have since stripped the hoop weight and matched them. They now have identical specs at: 315g, 31.0cm balance, and a 300g swing weight. It's a cool machine and I'll be interested to take some of the rackets I've done for my college players and see how close they are. The Yonex will be fine because their batch specs are good but I'll be curious to see how different the SW are for the Wilson, Head, and Babolat frames. I bought a Accuswing2 from this dealer recently. yes. they don't ship outside China. So I contact some logistic forward company which is located in China. They ship to local forward company, then this company ship to South Korea again. total cost is around 850$.